Junos Security is dead! Long live Junos Security! I was hoping that title would catch your attention. First and foremost this is a technical blog to discuss neat tricks and tips that I use daily, but sometime it’s a good idea to jump off the path and take a look at what is going on in the tech world. It is high time we start looking past traditional security firewalls or Next-Generation Firewalls and see where the path takes us. For starters, I was recently at the Juniper Ambassador’s Conference and got to speak with the brilliant minds at Juniper Networks. I am quite sure everyone has heard about the significant changes that has been occurring at Juniper, and like many of you I had my concerns/reservations. While it is important to note is that there are still plenty of opportunities to improve the realm of Junos security in the short term I am excited for what is to come. I feel that there is always going to be a need for traditional hardware firewalls in the network. Certain features make it extremely tough to remove hardware appliances completely; in particular I am talking about the edge firewalls that handle massive amounts of IPSEC tunnels or NATing public/private IP’s. In the future it would not be a long shot to put security functions in other parts of the network. As an example by moving firewall functions to the hypervisor then we can reduce the need of massive firewalls at the head end. 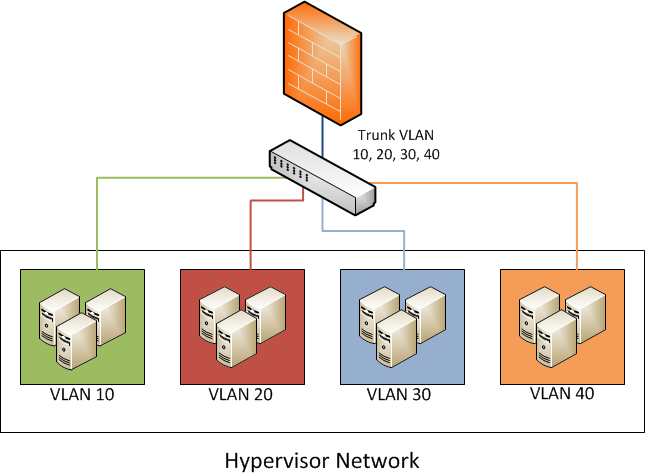 Typically you would have your network segments trunked to an interface on a firewall, or a unique interface per vlan directly connected to the firewall. This works great until you run out of interfaces, bandwidth, or processing power of the firewall – especially for that pesky intra-zone traffic! By offloading basic firewall or even IPS features to the hypervisor (which has far more compute power than that of a single hardware firewall) we can now free up the firewall to do more important tasks, and increase our scalability significantly! Combining this solution with some of the cool tools like Firefly Packer to help with automating these deployments you can have a significantly faster turnaround time for the needs of your network. This type of design also helps with reducing the failure domain of the network – if an issue crops up one of the hypervisor firewalls it only affects one group of devices, instead of causing an entire network outage. Smaller failure domains = higher overall stability. Now certainly there are still a bunch of unanswered questions about designs like these, but this is the start of a significant change in how we all can view security and its application to the network. Sometimes it helps to take a step back from what features are missing in a device, and instead look at the opportunities that exist today and in the future. 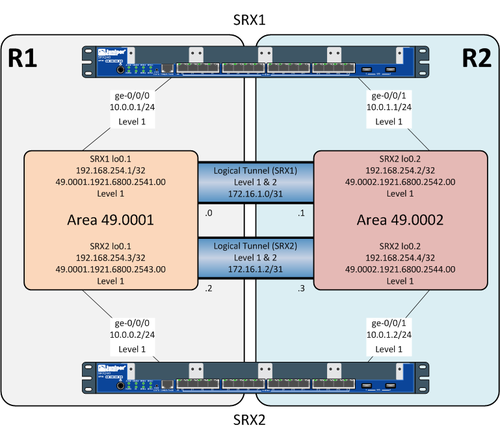 It’s been a while since I wrote up a new post, so I thought I would come back with a nice post about the changes in configuring DHCP Servers on the SRX’s. Since Junos 12.x a new DHCP process came out to help fix some long standing issues with the existing feature. In this post I will discuss the old configuration, some of the problems I would regularly encounter, and the configuration of the new DHCP process. Junos is a very powerful networking operating system, and by harnessing it we can perform more unusual tasks than we could with other alternatives. Today I will discuss a more unusual scenario to utilize conditional router advertisements and NAT to provide access to services. When the network is unavailable then the SRX will automatically disable its advertised routes. While waiting to hear back on the results of my JNCIE-ENT exam I have decided to start learning about the service provider realm. In particular there are many techniques in the service provider realm that could be used to enhance the toolset of any engineer, and potentially can be used to re-think the architecture of any enterprise. In this post I will discuss IS-IS, and how to perform a basic configuration of it. IS-IS is an interior gateway protocol used in many networking environments to dynamically update routes. It utilizes link-state information to make routing decisions, and uses Dijkstra’s algorithm to calculate the shortest path on the network – similar to OSPF. An IS-IS network is called an Autonomous System (AS) and is divided up into segments called Areas. A single AS can contain multiple areas, and each area contains End Systems (ESs) and Intermediate Systems (ISs). ESs send and receive packets while ISs send, receive, and relay packets to other ISs. For simplicity’s sake we will consider an IS a router from this point forward. In each area a router can be configured to relay routes into its own area (Level 1), relay routes to another area or AS (Level 2), or act as both a Level 1 and Level 2 router. This is very similar to OSPF as Level 2 router could be considered a backbone area, and a Level 1&2 router behaves like an area border router. How Do I Configure IS-IS? Let’s first start with the interface configuration. The AFI and Area ID on each loopback address should match up to the area listed in each diagram. Now onto the virtual router configuration, and enabling IS-IS in each virtual router. We have now successfully configured IS-IS inside Junos! I recently took the JNCIE-ENT Beta exam in Sunnyvale, CA, and have been meaning to post my thoughts on the experience. I began to study and understand the wide world of L2/L3. It was a major change from the Security track that I was so familiar with, but all in all it turned out to be a very exciting and enlightening experience. It also was my first real exposure of IPv6 outside of a HE Tunnel on my SSG at home. Unfortunately the exam itself was an eye opening experience for me in what I did know, and more importantly what I did not know. I fell short of the requirements needed to pass the exam, and got the unpleasant email that I failed the exam. It was a humbling experience, and after a few months I began to hit the books again for attempt #2. In the meantime Juniper had put out an announcement for candidates for the JNCIE-ENT Beta exam in February, and they accepted my request to participate in the beta. This was an excellent opportunity to attempt the exam again as well as provide feedback on the exam team. A huge THANK YOU goes out to Liz Burns and her team on providing such an opportunity! After finding out some of my friends and Internet colleagues were also accepted into the beta we began to collaborate to truly understand some of the techniques needed to understand the objectives of the JNCIE-ENT exams. We were able to provide scenarios/tools used to test many of the requirements needed to pass the JNCIE-ENT. Individuals such as Tim Hoffman were valuable as well as instrumental in leading the collaboration efforts. February finally rolls around to sit the Beta Exam. It is important to note that these exams are under a very strict NDA so I cannot detail the exam itself. That being said I can say that the topics extremely thorough, and the tasks to configure/troubleshoot each topic would likely be seen in a real-world scenario. That being said even after taking the exam once already I almost got tripped up on a few requirements to get the network up and running. Fortunately Juniper does provide the entire configuration/examples guide, which was instrumental in helping figure the steps necessary to accomplish such tasks. The trick is combining PDF searches with CLI commands such as help apropos or help reference – quick tools to help find that correct command. All in all I had plenty of time to review my work, and continually test portions of the configuration to ensure that new changes did not break existing functionality. I completed the exam with about an hour to spare, and had plenty of opportunities to review each task to ensure that I understood what was being asked as part of the requirements. It was another great learning experience, and I am hopeful that this time I will earn a passing grade. Since this exam was a beta, I will have to wait for 2 months before I learn the results of the exam. Packet mode enables a SRX firewall to act strictly as a router, forwarding packets from a source to a destination without tracking sessions. This is useful for an engineer in certain situations such as high throughput applications that do not need full firewall functionality, or asymmetric traffic flows. We can also enable this mode on interesting traffic which is called Selective Packet Services. More details on Selective Packet Services is available on the following PDF as well as the rest of this post.